You probably don’t want to put faith into anyone as someone dearest sever the trust bond leaving you broken like shattered pieces of glass; tiny yet sharp enough to inflict harm. When anxiety takes over your mind and your nights become restless it becomes hard to sleep stress free. While for some people the opposite effect is longer hours of sleep and not wanting to leave the bed. Currently you have been experiencing change in eating habits quite irregular than before. Loss of appetite leaves you with less strength to get through the day. Loss in weight is directly linked to excessive stress resulting in the shape of fatigue, stressed muscles and low energy levels. 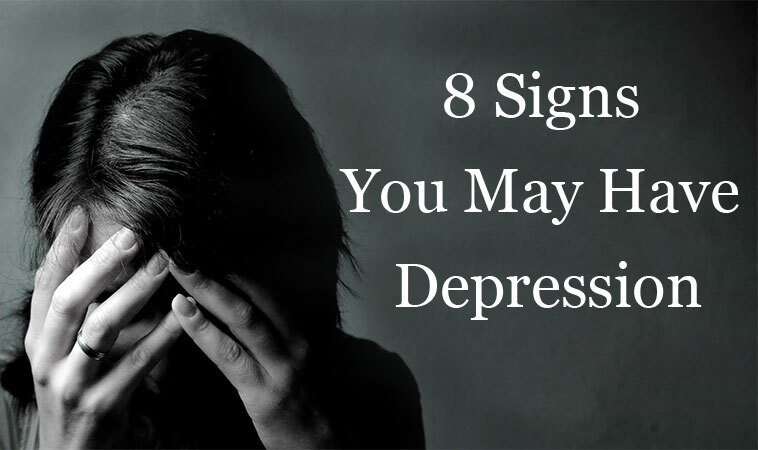 This turn out to be the obvious out of 8 signs you may have depression. Your emotional balance may suffer the most during immense stress levels. Your family members may be the victim of your emotional imbalance first. Suddenly an argument flares you up leaving you irritated and the next moment you burst into tears. Earlier you were an exercise freak but you feel worn out after few strokes. Sprinting through 20 stairs seems easy before. Currently, after 10 stairs you feel puffed lungs and immense pressure on knees. A clear mind is the result of organized working while a cloudy thinking leads to messy outlook. If your boss is unhappy from your current performance or your teacher has given you a C in recent tests then something disturbing is bugging you inside. Feelings hopeless enough that there is no hope left to be attached with life can be the warning symptom among 8 signs you may have depression. When continuous failures keep on coming and thrashing you time and again against the ground then reality becomes hard to resist but in such times a speck of light can pull you towards life.